Tonight, I was supposed to study for a course I'm due to go on soon. 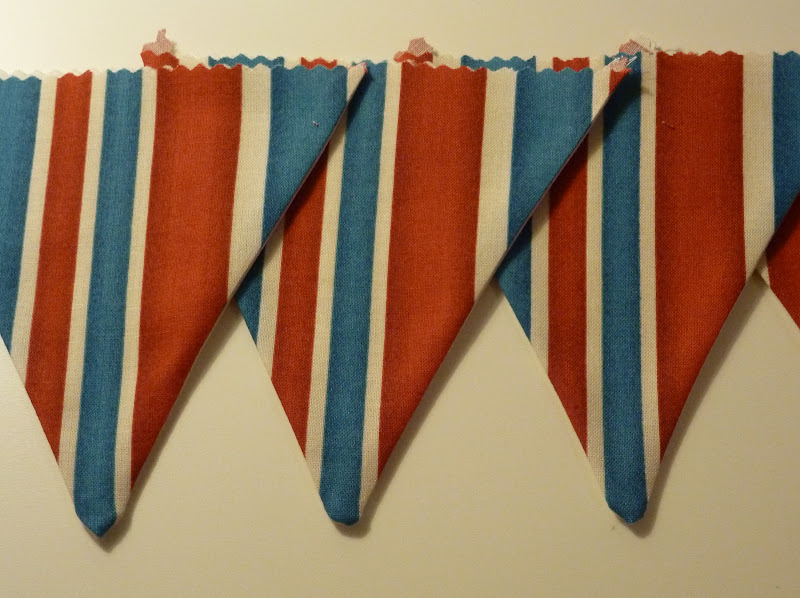 But when I arrived home from work and saw my colourful fabric on the desk, I got completely distracted and have spent a lovely evening in the craft room making bunting :) The fabric is in Union Jack colours so this will be strung all over the place this summer! I have a mild (ish!) 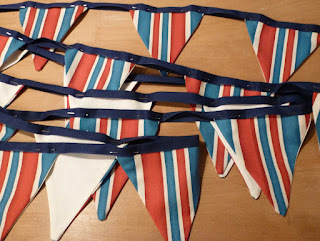 obsession about neatness and straightness and I really wanted to just cut triangles with pinking shears and stitch them on a piece of tape which is the easiest, breeziest way to make bunting but my obsession wouldn't let me. 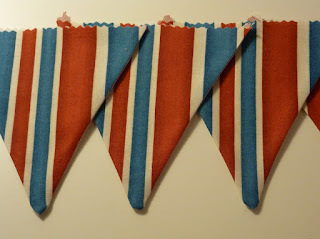 So here's my way of making backed bunting. 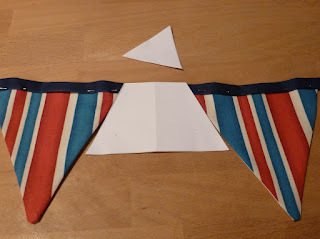 First fold a piece of paper in half and cut yourself half a triangle off it, open it out and that's your template to draw around. 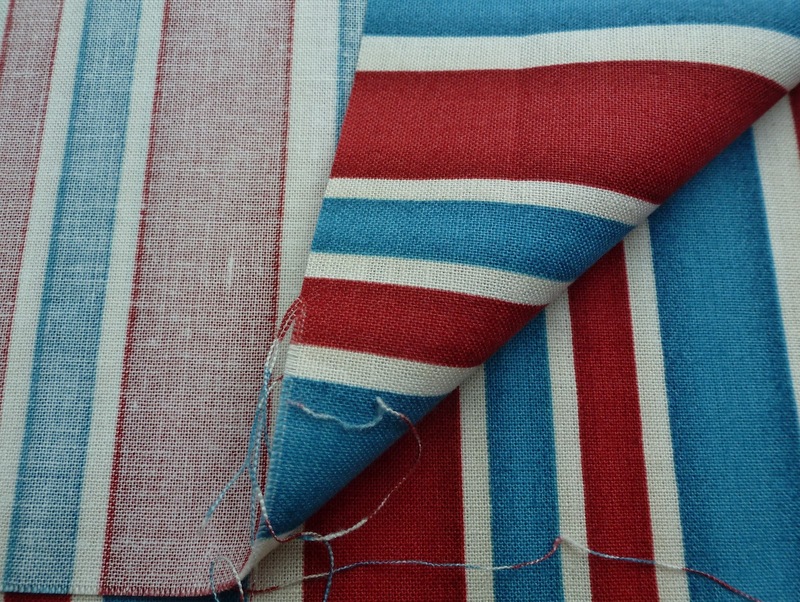 Place your patterned fabric right side to right side with a piece of plain fabric which will be the back. 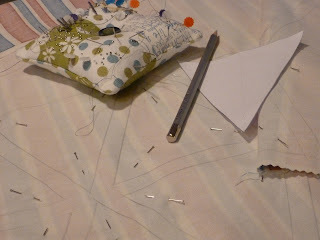 Use a silver quilting pencil or light pencil to draw round your triangle template onto the plain fabric. 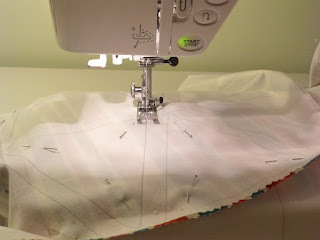 Pin in 3 places to secure and make sure your fabrics don't drift apart as you work. Don't cut the triangles out yet. Once they're all drawn onto your fabric, sew them down both sides but leave the top open because you'll need to turn them right side out. When all your sewing is complete, that's the time to cut them all out. 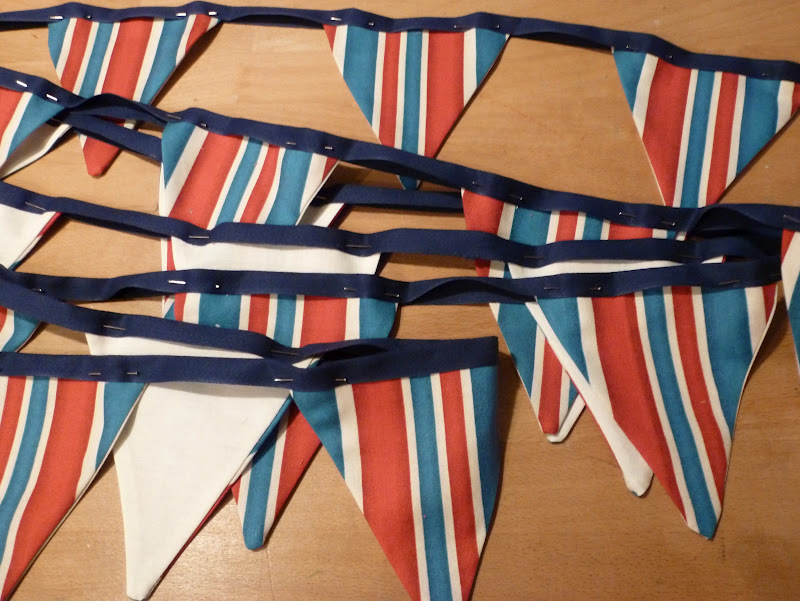 Here they are all cut out and ready to turn right side out. Once they're turned, give them a light press. 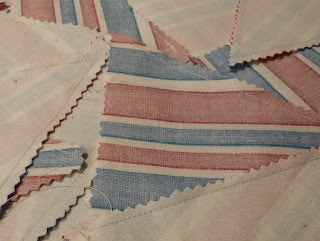 Using tape or bias binding (I happened to have some blue tape) fold it over the still open top of your triangles. I never measure the gap I want - I just use the triangle template as a spacer. 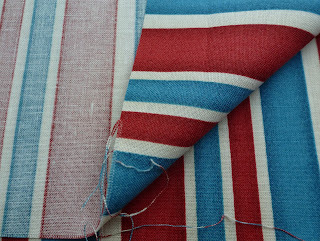 Play around to see what gap you want and when it's right, chop the top off your triangle.